Berks is considered by some to be a pioneer bare knuckle boxer. Three times (once unofficially) Jem Belcher dealt with Joe Berks (sometimes written Bourke or Burkes), who was a truculent, tough, sometimes drunken butcher from Shropshire and had a violent temper. In beginning this narrative or my life and rather turbulent career, I want it distinctly understood that I am not and never was ashamed of having been a fighter. To attain anything in this world every man must fight and to reach the top he must win. Life itself is a fight. Even the art of writing is a fight. If any of my readers have any doubts on that subject they should see me with a pencil and paper in my hand trying to knock ideas out of my head, trying to fill these pages. When I went on a grand tour of the United States and faced all comers, I did not find a single man as hard to knock out as I do this first chapter. As I said before, life is a fight from beginning to end. The world is full of fights, and those you see directing the affairs of the Nation are the winners. They have fought their way to the top, and that is the only way to get there. Even. the preachers have to fight. They go into the pulpit with the idea, of knocking out the Devil, and by the way that Devil seems to be about the only fighter that ever stuck it out regardless of age. They keep pounding on him, however, and while they have never succeeded in knocking him out completely, Old Satan has never got any better than a draw. The man who stands out in law, medicine or any other profession has to fight his way to the top, and the poor boy who starts out to reach the top was to fight his way to honours as well as to fight off poverty at the same time. Dan Donnelly was a carpenter by trade, and was born in Townsend street, Dublin, in 1786, stood 6ft. ½ in. in height, and- his fighting weight was 1961bs. At an early age young Dan gave promise of future greatness as a pugilist, getting away with all who had the hardihood to confront his strong arm and combative disposition. To use Pierce Egan's expression: “he floored all the milling coves in Ireland." In the use of the blackthorn, Dan was par excellence, and legend hands down no story of his ever being worsted in a shillelah fight, where wrestling, of which art he was the greatest exponent of his day, plays such a conspicuous part ; in fact, Dan was all fight, and being very partial to a " drop o' potheen' his combativeness showed itself all the more when the " craythur “ got into his upper story. JAKE KILRAIN'S LIFE AND BATTLES. Paris, Dec. 19, 1887.—Kilrain came as near whipping the champion of England today as a man could and still miss it. He knocked Jem Smith down thirty odd times in two hours and a half. There was no prospect of Smith winning, and every assurance that Kilrain would knock him out when the fight was called, on account of darkness ostensibly, but really because about 75 Englishmen saw the money that they had placed so radiantly on Smith going rapidly out of sight. Now that boxing has taken its place among world sports and has become of importance in training fighting men in the United States Army, millions of people are taking a new interest in old ring champions and their methods. For more than twenty-five years I have made a close study of our champions, have watched them in. their greatest battles, and have often put the padded mittens on with some of them myself, to find out through personal experience what traits of character or physical power made them superior to other men. Boxing comes to life with a bang with two such championship fights as McLarnin-Ross and Carnera- Baer stirring things up in the New York arena May 28 and June 14. Here are two championship cards that would have had Tex Rickard talking in millions—and taking millions in at the gates. That McLarnin-Ross affair is a wow No stumble match, this. Both boys know their way around the ring. It isn't often that champions in two weight closes meet under circumstances that make an even money bet a fair proposition. It would be fair this time. There will be little difference in weight. They fight at 147 pounds, welter limit Ross came back from his two weeks' training in the woods weighing just 148. "I've come back to America to see my old friends just once more," Charlie Mitchell told me when he landed in New York a few weeks ago. There was a touch of pathos In Mitchell's tone. The man who once fought John L. Sullivan to a draw after three hours and 11 minutes of desperate battling, is only a shadow of the once famous "Boxing Champion of England." Article “Fistic Flashbacks” published in undated “Sports Novels” magazine. After the murder of Stanley Ketchell, the world middleweight boxing title became vacant, and it was several years before George Chip emerged as champion. With the sudden and tragic death of Ketchell came numerous claimants for the vacant middleweight crown. ―Cyclone‖ Johnny Thompson, who stopped former title holder Billy Papke, at Sydney Stadium, probably had the strongest pretensions to this crown, but for some unknown reason failed to force his claims and gradually faded out of the picture as a contender. For several years the title was in dispute. Eventually George Chip became recognized champion when he KO’d Frank Klaus, who in the course of his graduation to the field of claimants had whipped Papke and George Carpentier. Al Palzer and Luther McCarty are to meet Wednesday In Los Angeles, where promoter McCarey is holding a series of heavyweight bouts for the double purpose of getting the coin and bringing out a new heavyweight champion When his series is over the final winner will have as good a claim to the championship as any one He will be the best of the present heavyweight crop. Equal of Old Time Champs and Rescue. IN my opening article I told how as a boy, making my way to school in Manchester, I was attracted by the crowds of betting men in Thomas-street, and how I saw and admired Sam Hurst, the "Stalybridge Infant," a well-known pugilist of those days. The love of sport must have been in my blood, and great was my delight when, not long after this experience, Tom Sayers and John Camel Heenan came to Manchester and I saw them box at a local circus. It was the first time I had seen anything of the kind in my life, and a long time was to elapse before anything in this nature came my way again. It gives a writer on sports a little perspective when he can look back to such champions an John L. Sullivan, Jim Corbett and Bob Fitzsimmons. These three were prize fighters. The term "prize fighters" has practically gone out of use, except by reformers, trying to give the gentle art of boxing a severe verbal jolt. It has gone out of use because there are no prize fighters now, and here haven't been any for many years. John L. Sullivan, Corbett and Fitz all started as prize fighters. Sullivan indeed as a prize fighter. All began with bare fist fights, to a finish, winner take all. They fought in me woods, the sand dunes, on barges, under cover of barns or out in rain or snow or sleet. Mostly they fought because they were filled with an ambition to prove that they were better men than the other fellows who liked fighting. They didn't say that the winner was the better boxer; they just said "the best man won." It was supposed to be a great test of manhood, to go out and fight until the loser was counted out. "JIM" DONOVAN A CHAMP AS BOCHE BOXER. ALL the world knows Theodore Roosevelt, the statesman; the man who turned the light on the corporate highwaymen. He has made the "Big Stick" respected. But the "Big Stick" must be guided by law, not so the fist; wherever you see a head hit it is the fighting rule ; a word and a blow, but the blow first the reverse of legal practice. In the following pages I propose to describe Theodore Roosevelt, the fighter, untrammelled by legal restriction ; the lover of fistic encounter, as I know him; the man of brawn and muscle, with a genuine fighting spirit and the courage of two ordinary men to sustain its promise. I intend further to describe his methods of attack and defence, and to note the analogy between the spirit he exhibits in boxing and that which has urged him on in those political encounters which have made him famous. Lithe and straight as a young tree, pink as a boy and with keen gray eyes as snapping as the eyes of one, Professor "Mike" Donovan, instructor extraordinary in the art of boxing to those of the New York Athletic Club, slapped a six foot young man upon the shoulder. He had belabored that, young man sufficiently during the four smart rounds of the lesson, and that lesson was over. Five following young men then did he proceed to belabor —for his position is no sinecure—when he, in turn, became the victim of another art. The reporter was waiting, and what was there for Professor "Mike" Donovan but to be interviewed? "Mike" Donovan? One closes one's eyes as one thinks of him. One thinks of the champion that he once was, of the furtive chase in coach and train that man might meet man in the staked, circle, of the rough roped ring, of the hasty crowds scampering through fields toward the place when men would struggle, of the attendants with whip and club to keep clear the space about the ring, of the stripped gladiators, of the naked fist that panted and fought in sun and sleet and rain — of the old days of the prize ring, that lived with Coaches and crinolines and the things of yesterday. It wasn't my fight with Leach Cross," snapped little Joe Mandot the Southern champion. "'Course Leach knocked me out, all right I'm not trying to discredit him in any way. He knocked me out as far as they knock 'em out. but it wasn't my hardest fight he continued, vehemently. I had Cross licked a mile until I ran into that one in the last round. It was an easy fight for me up to that moment, and when I tell you that a knockout, a real knockout, doesn't hurt, why, you will understand the reason. Course a knockout does hurt. I should say so. But not physically, it’s a mental pain. It hurts a fellow’s feelings. His pride and his reputation, and the pride of New Orleans's famous French market shook his head sadly. For a year or more the South has sung praises of Joe Mandot. From Memphis to New Orleans the. whisperings have carried, and then over in Chattanooga, Nashville and Atlanta the same thoughts have been thought — that Joe Mandot would one day be champion. Now the fight public beyond the Mason and Dixon line is chattering its "I told you so's," and the North, East and West are beginning to assume a healthy interest in the New Orleans boy who knocked out Young Saylor the conqueror of Battling Nelson and Ray Bronson recently. Matty McCue, Racine’s sensational little lightweight, demonstrated his right to be considered a top notcher in his division, last evening, when he held Joe Mandot of New Orleans, an old head , who has met and held his own with all of the leaders in this class, to a slashing draw in their ten round conflict before the Racine A.C. at the Lakeside arena. It was one of 'the prettiest fights ever seen here abouts and the crowd of three thousand fans who witnessed it expressed their satisfaction at the end of the bout by cheering the game little battlers to the echo as they left the ring. The street corner championship of Indianapolis still hangs in the balance; the laurel wreath is still suspended above the heads of Ray Bronson and Milburn Saylor, two of the toughest fistic gentlemen who have represented this city in the ring in many years." The bout last night at the Auditorium went the full ten rounds with both men battling at the bell, One of the biggest crowds that has ever witnessed a boxing match in this city saw the mill. As the timekeeper's gentle tap on the gong ended the hostilities a shout of approval went up that was weirdly mixed with praise for Bronson and praise for the Kangaroo Kid. 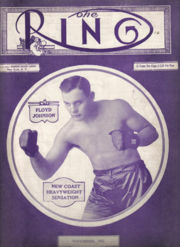 Ray Bronson, welterweight championship claimant, last night successfully defended the title he has assumed when he outpointed Young Erne of Philadelphia in a dazzling ten-round bout at the Auditorium. Reverence for heroes is natural. In all ages of the world respect for great men has distinguished the masses. Our old ancestors made kings of their muscular heroes and placed men of great physical powers on tripods supposed to raise them nearer to heaven. In the legends of every race tradition tells marvelous stories of the endurance of heroes. They were often clothed with the attributes of deity, and demi-gods were as common in ancient times as idols and wooden images are to-day in darkest Africa, or among the benighted Mongolians of China. The age of steam and electricity has its gods too, its demi-gods to whom civilized races pay the tribute of their loyal praise. Literature and the churches cannot stay that irresistible impulse which makes men take off their hats to other men who have added to the usual attributes of man a longer reach of arm, a quicker eye, a more skillful delivery, Marquis of Queensberry Rules. And so it comes that James Corbett is now our god, tarrying on the earth under the soubriquet of " Champion Jim." The world, which is a fickle jade, had tired of John L. Sullivan. It longed for a new name, for another god. Humanity likes heroes but it does not like to believe that one man is so great that none greater can ever appear. We all like to believe that what man has done man can do, therefore Corbett's victory in playing with Sullivan as a cat tosses a mouse, teaches us to believe in the possibilities of man. And so Corbett may one day meet his better. May he be able to stand prosperity," and to bear himself as he has hitherto done, like a gentleman, forgetting none of the obligations to friends and wife and family. If he shall live like an honorable man the world will gladly see him wear his honors thick upon him for many years to come. In 1911 Tommy Ryan wrote a series of weekly articles for the Syracuse Herald entitled “Nineteen Years In The Ring”, the story of the life and battles Of Tommy Ryan, retired middleweight champion of the world as written by himself.There are 38 weekly instalments and I have reproduced them with as much accuracy as possible given the poor quality of some of the documents. In addition to the text I have added various other items of interest. The remaining articles are in the next edition. In 1911 Tommy Ryan wrote a series of weekly articles for the Syracuse Herald entitled “Nineteen Years In The Ring”, the story of the life and battles Of Tommy Ryan, retired middleweight champion of the world as written by himself. There are 38 weekly installments and I have reproduced them with as much accuracy as possible given the poor quality of some of the documents. In addition to the text I have added various other items of interest.